It's been three long years since Deadbreak. That's what everyone's calling it – the day the dead rose. Every day since then Jeremiah Reid has had one goal: to make his way to his daughter. It's a new world out there and no one is safe. People are meaner, cities are in ruin, supplies are scarce. If he’s going to have a chance he’ll need his wits, a little bit of luck, and lots of ammo. 4.0 out of 5 starsA Zombie Filled Adventure! As a big fan of The Walking Dead and other similar books/TV content featuring a zombie-apocalypse story I was intrigued by Deadbreak’s story. The main character Jeremiah is doing his best to survive each day along with his furry side-kick Joe, the dog. He has a very tough exterior and hates to rely on anyone for help. On the inside though, he has a very kind heart and always looks out for others; as we see in many events throughout the book. The book throws the reader immediately into the zombie-filled universe and we get snippets of what life was like before the outbreak through Jeremiah’s flashbacks. Though he can be a bit crass at times, he’s a good guy and his character really grew on me throughout the book. I was rooting for him throughout the whole story. I liked that the story was action-packed and just when you thought the characters are out of danger, they are thrown into the crossfire once again. At times, I was on the edge of my seat waiting to see what would happen next! The story does get a bit gory and violent at times, but it was nothing that I felt it was too over-the-top. If you like stories with a thriller aspect, zombies, and constant action, this is a book for you! 4.0 out of 5 starsJoe rules. Ok, what sold me on this book is the main character has a dog, Joe. Totally reminds me of Darryl from TWD and his furry companion. And I love Darryl. The pacing of the book is very good in the beginning but drags in the middle. I became confused with the last chapter as I felt it didn't aline with the book's storyline. Jeremiah was well written and for the most part I could connect with him. I would say he would be a mix of Earl and Darryl. Though at times his characterization was inconsistent and didn't fit. As with most zombie/post-apocalyptic stories, there is a degree of gore and violence but it isn't gratuitous. Ultimately, I didn't find anything that set this book apart from other zombie stories. It sort of felt a bit like fanfic from TWD at times. And I did like the way the author got into the minutia of the complications of community (almost a little bit of the Strain mixed in there). Overall, this was an enjoyable read. There are funny parts and the pacing moves the book along nicely. Of course, Joe is a definite plus (I mean, the german shepherd from I AM LEGEND was half the reason I even bothered to watch the movie). 4.0 out of 5 starsFun read, even for the zombie phobic. So I'm not usually a fan of zombies, in fact I usually avoid TV shows, movies and books that feature them, but the reviews for Deadbreak had me intrigued. I am a fan of post apocalyptic survivor type stories so I decided to give this a try. I'm super glad I did. This book is so entertaining and so smartly written, I could barely put it down. Yes there is violence and gore, but the characters are real and endearing the dialogue makes you laugh out loud. Highly recommended, even if it's a little outside your comfort zone. 3.0 out of 5 starsZombies, action. 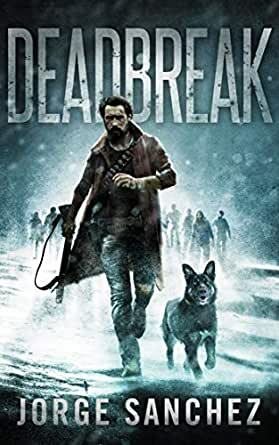 If you are an avid reader of zombie action stories and can't get enough of post apocalyptic type tales, then this is probably a good pick for you. As with any story of this nature, there is plenty of action and sarcastic dialogue. Some of the similes caused interesting mental images. For example, when describing the spread of the zombie virus, the author writes that it "moved faster than green grass through a goose." To be honest, not much stood out to set this apart from many of the zombie outbreak/disaster books and movies that have been dominating mainstream pop culture for years. I did like the relationship that the protagonist had with his dog. Their conversations were amusing.